After moving cross-country for a new job, I needed an outlet for my creative energy since I didn’t have house remodeling or landscaping projects in which to channel that spark to create. The universe has an immense sense of humor and profound irony in that I got hooked on card-making. The irony being, I have about a five percent track record of actually remembering to send said cards for just about any occasion. Indeed, I have a whole shoebox of unsent cards, both of my own creation and store-bought. I also had the genius thought that it would be far more economical than spending upwards of five dollars on a store-bought card. 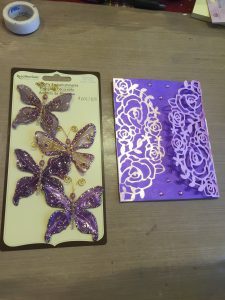 Those who have been crafting for any length of time are probably laughing at that thought, having spent hundred times over in craft supplies since this journey began. 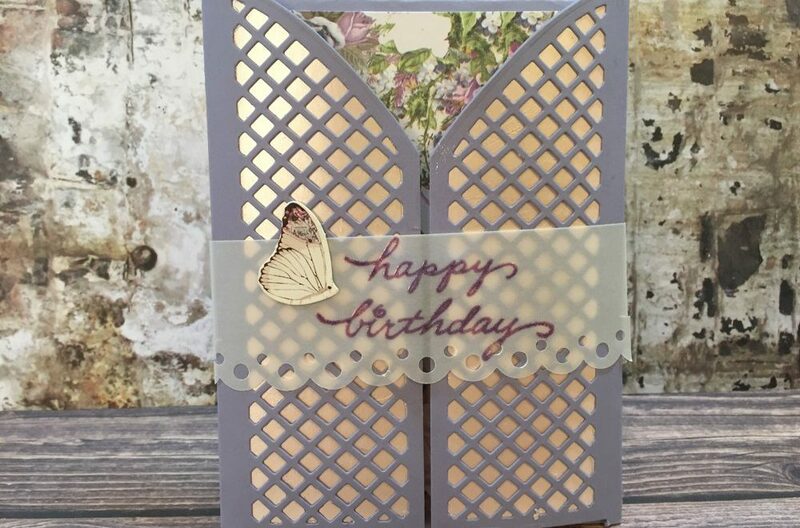 The immediate challenge was to create a feminine birthday card for a dear friend’s birthday. When designing a card, I first take care to select complementary colors. 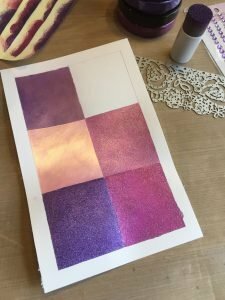 I also have a love for sparkly stuff, manifesting itself in a vast selection of Viva Decor products and an almost-complete collection of sprays, powders and embossing powders from Lindy’s Stamp Gang. 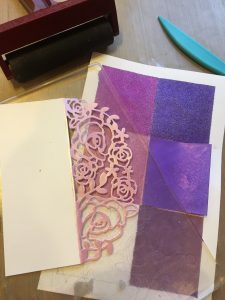 For this card, I knew I wanted to use the A2-sized rose die from Scrapbooking Made Simple. This one is sold out, but I’m sure there are many others on the market. Something from the Silhouette Design Store could also be used to a similar effect. The roses drove the color choice for the overlay to be pink. Inka Gold in Rose Quartz was the perfect choice. Loving sparkly stuff, but not wanting it to be too overwhelming, I then set out to find the right shade for the backdrop. I made larger than usual color swatches. 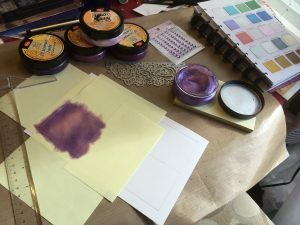 To compare, I used 3 purple Inka Gold colors and the 3 Viva 3d Stamp Paint purple/pink hues. Hydrangea is on order so there’s an open spot for that. 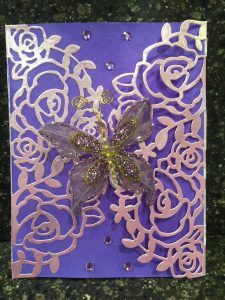 The 3d Stamp Paint was just a little too sparkly for a backdrop behind the rose overlay. 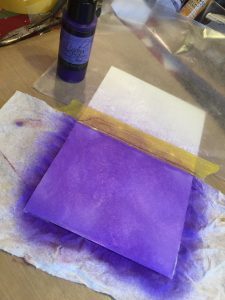 I also created a swatch using Lindy’s Stamp Gang French Lilac Violet and that was the winner. The shimmer was subtle and had a pinkish hue to it, perfectly setting off the pink in the overlays. Color chosen, I moved on to the card base. Having recently paid nearly a dollar each to mail Christmas cards, I knew I needed to keep the weight down on this card. So I decided I would colorize the front of the card base instead of using a separate sheet that would get glued to the base. After printing the sentiment for the interior, I used yellow Frog Tape to mask off the card at the fold. This ensured no spray would seep to the back edge. A layer wax paper adhered with more Frog Tape protected the back of the card from any overspray. I also used a paper towel underneath the front so no drips would sneak under and corrupt the left inside of the card. Et voila! All the overspray was soaked up by the towel and the inside of the card remained pristine. 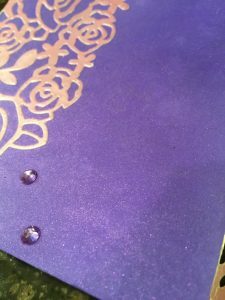 For the rose overlays, I used the Inka Gold on cardstock and buffed it out. Then I ran the paper for the left overlay through my Xyron machine prior to die-cutting and stuck it to the card front after the spray thoroughly dried. For the right overlay, I included a 2 1/4″ flap and glued that to the back of the card base. It made the whole thing a bit more sturdy as an added benefit. 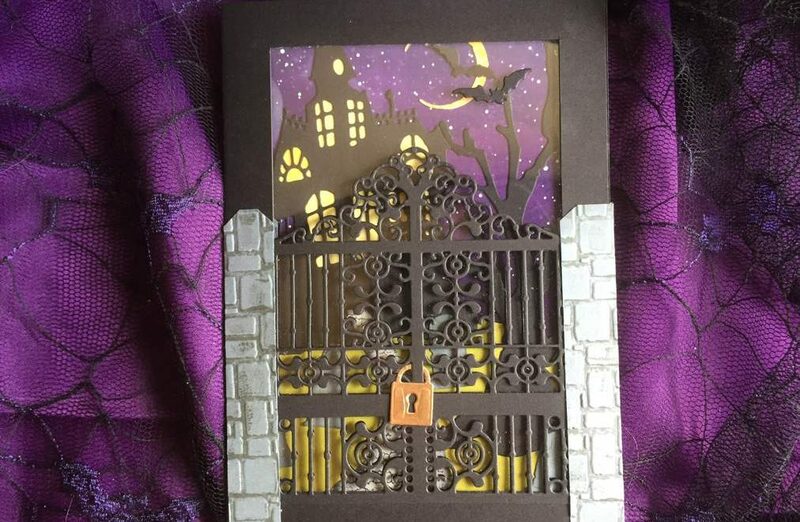 The card just didn’t seem complete, even after adding some violet rhinestones. 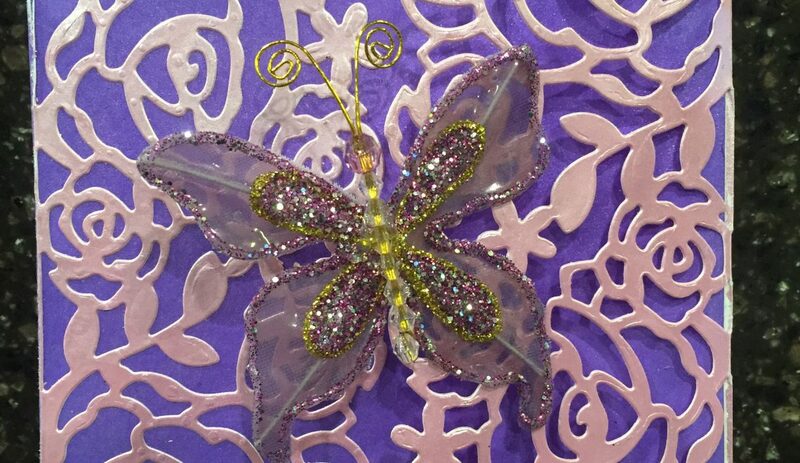 While looking through that box of unmailed cards, I had stumbled across a package of butterfly embellishments. I originally wasn’t sure about how the color played with the spray and the pink. But once it was all together, the lightest of the butterflies did the trick to pull the whole card together. Card accomplished. Now, if I can just remember to drop it in the mail! Happy Birthday to some lucky recipient! 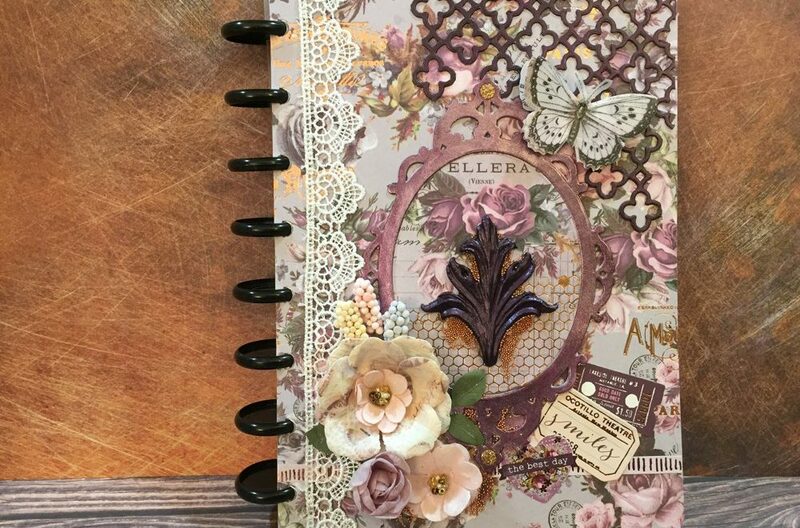 The beautiful shimmer has a pinkish hue that goes well with the rose quartz Inka Gold on the die cut.